Our Pay-as-you-Go service is the most convenient for ad-hoc senders. Simply use your credit card as you send the campaign and you're done. We keep your account active - collecting subscribers and managing unsubscribes so it's fully available for when you're ready to set-up your next campaign. Our Pay-as-you-go service costs €10 to send each campaign. This gives access to the editor, get's the campaign delivered and provides all the amazing reports. Each email address that you send to costs just 2c. Bigger senders can save by buying credits in advance. Frequent senders that send one or more campaigns each month might be better on one of our subscription plans. 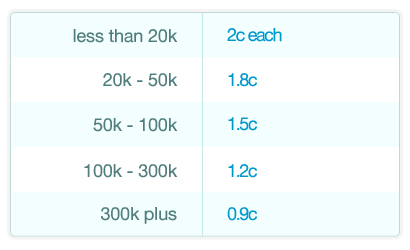 Subscription pricing is based on your total list size as below. Now, while great value for many we often come across customers for whom subscriptions are the more expensive way to go. Get in touch. We'll ensure you're on the right plan for your business. As you should expect - Send.ie email marketing subscriptions are month to month - no commitments and no contracts. Buy in Bulk, and Save. Large and small senders alike can benefit from buying credits in bulk - with savings up to 50%. We'll put your credits on your account to use as you wish… and don't worry. They never expire. Each campaign costs 500 credits to deliver and a single credit for each email address that you send to. We're local. And we're not snowed under with too many customers. That's what allows us to allow you to pay any way you like. If paying by credit card is fidgety for your business - using personal cards, tracking expenses etc. - just let us know. We can invoice for subscriptions of credit purchases and you can raise a payment by check, transfer or even Paypal.